Chilldyne’s Cool-Flo System is an efficient and low cost liquid cooling system that is 4,000 times more efficient than air for cooling electronics and can reduce average data center power consumption by up to 45%. This leads to dramatically lower operating expenditures. For new data center projects, the cost savings is even more dramatic as capital expenditures can be cut nearly in half. The Cool-Flo system utilizes innovative and low-cost technology that fits into existing data center infrastructure, reducing implementation costs and minimizing structural and procedural changes. An overall power reduction of 45% can be attained using the Cool-Flo system. 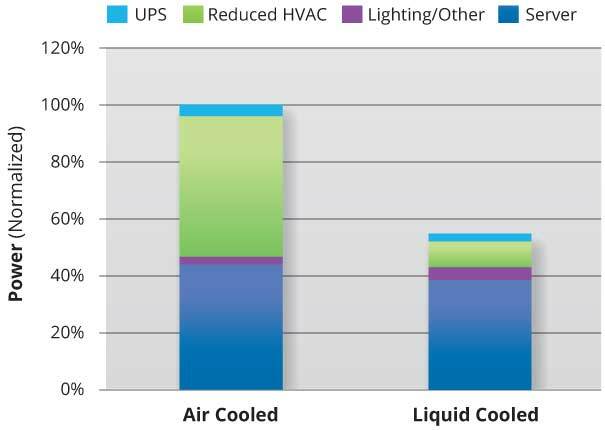 The savings comes from a combination of HVAC elimination, reduced CPU leakage current and reduced server fan power. The average data center can bring their Power Usage Efficiency (PUE) down to 1.2 or less regardless of the climate. The return on investment in Chilldyne’s Cool-Flo system will average approximately one year. Return on investment will vary, depending on the current operating characteristics of the data center such as PUE and the cost of power.